Pamper yourself with a visit to the spa, which offers massages, body treatments, and facials. You're sure to appreciate the recreational amenities, which include 2 outdoor swimming pools, outdoor tennis courts, and a sauna. Additional amenities at this hotel include complimentary wireless Internet access, gift shops/newsstands, and a hair salon. With a stay at Villa Galijot Plava Laguna in Porec, you'll be near the beach, within a 10-minute drive of Aquacolors Porec and Brulo Beach. 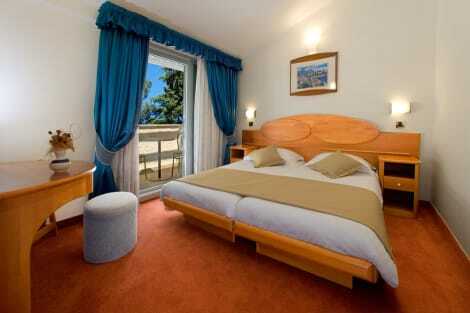 This 4-star hotel is 2 mi (3.2 km) from Porec Marina and 2.2 mi (3.6 km) from Decumanus Street. Relax at the full-service spa, where you can enjoy massages, body treatments, and facials. You can take advantage of recreational amenities such as outdoor tennis courts, an outdoor pool, and an indoor pool. Additional amenities at this hotel include complimentary wireless Internet access, concierge services, and gift shops/newsstands. 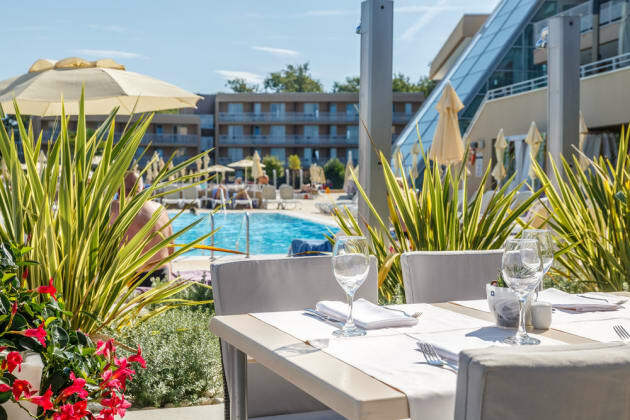 This beach hotel is situated in a pine-tree park by the sea, a pleasant 10-minute walk from the picturesque old town of Porec. Guests will find numerous restaurants, bars and shops in the centre of Porec, which is approximately 1 km from the hotel. Nearby places of interest include Beredine Cave (20 km away), Pula (50 km away) and Brijuni National Park. The hotel offers 223 rooms in total. Facilities include a 24-hour reception, currency exchange facilities and lift access. Younger guests can enjoy a children's playground, while their parents can rest at the cafe, the bar or the breakfast room. Each room features an en suite bathroom with a shower, bathtub and hairdryer. Further amenities include a double bed, a phone and a TV. Make yourself at home in one of the 105 air-conditioned rooms featuring LCD televisions. Satellite television is provided for your entertainment. Private bathrooms have complimentary toiletries and hair dryers. Conveniences include phones, as well as safes and desks.